Every student knows the high price of books in college. Getting those books is essential, but you don't have to break the bank to get what you need. The campus bookstore is almost always the most expensive option. Instead, check out comparison websites or CampusBooks or bigwords.com to see a range of discounts and prices for buying new or used books, or even renting them for a semester. 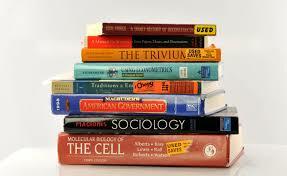 However you get your textbook, make sure you purchase the right edition. New editions generally reconfigure the chapters even if they add very little new content, so while you might not need the latest version you could have trouble finding the same information that your classmates have. You can ask your professors for the ISBN number of the books you need prior to ordering - and also ask them if it's OK to order an earlier edition. They will be happy to help you find a deal if it helps you get the information you need.